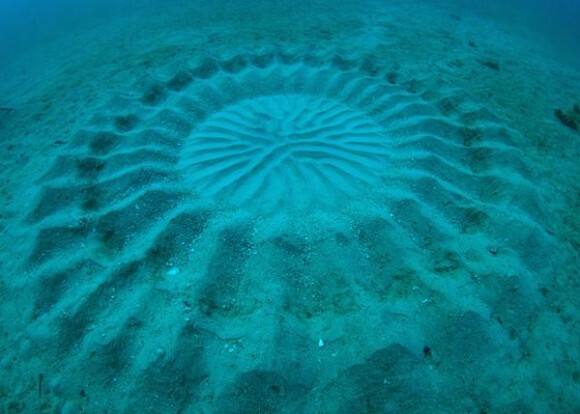 You may have heard about this, but the attached photo is of a “carving” made by the tiny Puffer Fish off the coast of Japan. 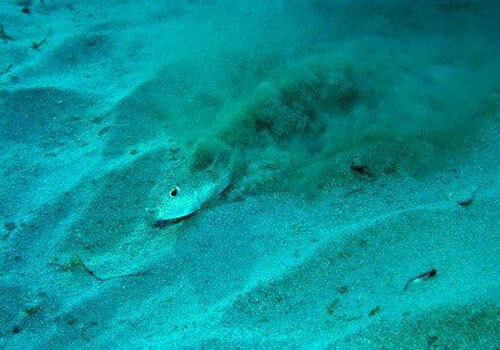 It was discovered 80′ deep in the Pacific Ocean and is 6.5′ across. Shells are also incorporated into the sculpture. The fish makes the sculpture to attract the female and it is believed the contours protect the eggs from underwater currents that would otherwise destroy them.
. . . the second explanation strikes me as more compelling. The Republican primaries, and then the Republican convention, have shown America a party far removed from the “compassionate conservatism” the GOP tried to sell in 2000. Instead, we have a party that’s been taken over by Tea Partiers, nativists, social Darwinists, homophobes, [birthers], right-wing evangelicals, and a few rich people whose only interest is to become even wealthier. These regressives were there in 2000, to be sure. They lurked in the GOP in the 1990s, when Newt Gingrich took over the House. They were there in the 1980s, too, although Ronald Reagan’s sunny disposition gave them cover. In truth, they’ve been part of the GOP for more than half a century — but never before have they held so much sway in the party, never before have they called the shots. The second view about Romney’s decline also explains the “negative coat-tail” effect — why so many Republicans around the country in Senate and House races are falling behind. Scott Brown, for example, is well-liked in Massachusetts. But his polls have been dropping in recent weeks because he’s had to carry the burden of the public’s increasing dislike of the Republican Party. The same is true with regard to Republican senate races in Florida, Virginia, and every other battleground state. One thing about this campaign that has struck me is the amount of time Romney spends explaining what he meant to say. My memory of past elections is that the Republicans were always on the attack and the Democrats were on the ropes, explaining and apologizing. But the shoe does seem to be on the other foot this time around (though thanks to Romney’s gaffes the Democrats don’t need to attack) and if Romney doesn’t shine in the debates — his own people suspect he will not — Obama should retain the White House. The Senate race is a whole different ball game, as they say. But Reich’s analysis gives rise to this interesting question: if enough Republicans get sick and tired of the nasties and crazies who have taken over their party, could a third party with both money and political clout be aborning? Interesting. In response to a genuine need for greater sensitivity to the chronically disadvantaged in this country there came into being not long ago the serpent “political correctness.” This serpent, originating from the best of motives, has become so large that it threatens civilized discourse itself which was already weakened from constant abuse. We must now watch everything we say for fear we might offend someone somewhere at some point. And the ones who determine what constitutes “offensive” are the offended parties themselves. There is no court of appeal. And that’s the problem. Some years back Chinua Achebe, the great Nigerian novelist, wrote a scathing essay attacking Joseph Conrad’s Heart of Darkness as a “racist” novel. Achebe charged that the novel was racist because of the author’s frequent use of the “N” word and his reference to the natives of Africa in less than glowing terms. Achebe’s essay has been anthologized widely and is now considered a classic of its type. I published a rejoinder in Conradiana, the journal dedicated to Conrad scholarship, which was not widely anthologized, incisive though it was! I insisted that Achebe didn’t know how to read a novel, that Conrad did not denigrate the native people — on the contrary — and I defended Heart of Darkness as one of the greatest novels of all time and one that we should continue to read — in spite of the “N” word. The problem is not whether or not Conrad or Conrad’s novels were “racist,” whatever that might mean, but where we draw the line. Edith Wharton also uses the “N” word with reckless abandon. In fact, writers of her generation pretty much did so because that was the way people talked back then. Use of such words lends the novel verisimilitude, an important weapon in the writer’s arsenal. She also slurred Jews, as did Shakespeare and Dostoevsky, among others. Again, where do we draw the line? The problem doesn’t stop with literary works as a blog in the American Council of Trustees and Alumni publication “Inside Academe” recently points out. The Chronicle of Higher Education fired a writer of fifteen years, Naomi Schaefer Riley by name, because she wrote a piece attacking Black Studies dissertations “for substituting political partisanship for objective research and analysis.” Her piece resulted in 6000 petitioners demanding that she be fired since she was clearly “racist.” Now whether or not she is a racist (again, whatever that means) she was never allowed to defend herself or presented with the evidence of her mistakes, whatever they might have been. Instead of a lively discussion of what dispassionate scholarship ought to be or what racism actually is, she was simply accused and fired. As the blog in “Inside Academe” notes in its final paragraph: “The Chronicle missed a chance to stand up for intellectual freedom and intellectual engagement. They kowtowed to their constituency — the academy — deciding that political correctness was more important than the search for truth and the defense of free speech.” This seems to me to be the central issue here. Have we really come to the point where claims are disallowed if someone uses an offending word such as “savage,” contends that sloppy work is being accepted in our academies of learning, suggests that a woman was fired because she was incompetent, or an elderly man (such as myself) refused a job because he is unable to lift 200 pounds over his head — when these things may in fact be true and perhaps even important? If so then not only the academy but the wider culture itself has become impoverished and shrinks back on itself out of fear of intellectual engagement and the free exchange of ideas — no matter how disturbing. This is a huge price to pay not to offend someone, somewhere, sometime. Depending on whom you read — and whether or not you listen to Mitt Romney himself — the Republican candidate is not doing well in the race for the highest office in the land. He spends a great deal of time these days taking his large foot out of his mouth and trying to unsay the stupid things he either did or did not say. He seems inept on such a large stage. As some wag recently noted, it’s remarkable that even with the golden spoon he was born with in his mouth he still finds room for his foot. In any event, a recent editorial in the New York Times was speaking to this point when it mentioned in two key paragraphs what seem to be the central issues in Mitt’s slippage. To some extent, Mr. Romney’s diminishing stature is because of two recent statements that revealed his deficiencies to a newly interested audience. He falsely suggested that the Obama administration was sympathetic to the violent Muslim protests in Libya and Egypt, illustrating his ignorant and opportunistic critique of foreign policy. And he was caught on video belittling nearly half the country for an overreliance on government handouts. These moments, though, were not fumbles or gaffes. They were entirely consistent with the dismissive attitude Mr. Romney has routinely shown toward non-Americans or the nonrich. Now even long-undecided voters are starting to catch on and dismiss him. The two points referred to in the first paragraph have received a great deal of attention, as well they should. But it is the reference to the “dismissive” attitude that caught my interest. I think this is right on. Apologists for Romney have been quick to explain that Romney’s comments have been taken out of context and that may well be the case. But the attitude that is reflected in the comments doesn’t require a context: it reappears in numerous off-the-cuff remarks and even in prepared statements and they reveal a man who really doesn’t care about those who are different from him and his wealthy friends. Such people don’t seem to appear on his radar — except as something to avoid as much as possible. And this is deeply disturbing. We cannot expect politicians to be compassionate, I suppose, or to care for all of the people in this country — given the extreme heterogeneity of our teeming masses. But one can expect that a man or a woman who runs for the highest office in the land would include under the umbrella of his or her concerns large numbers of the people who will make up their constituency. I speak about the poor and disadvantaged. And the president assuredly must also be vitally interested in and knowledgeable about those in other countries whose fate is closely woven into the interests of the country he or she hopes to lead into a shrinking world. One would like to think that even politicians can show concern for people different from themselves. But Mitt Romney does seem to give off the aura of a man who has led a protected life with all the advantages enjoyed by the wealthy in this country — with his tunnel vision focused on jobs and the economy and his delusions about how the rich make it on their own and the poor must lie on the bed of their own making. And this despite the fact that he likes to present himself as one who worked his way through college and knows how the other half lives. If in fact Romney is slipping in the polls and in the end he loses this election, this editorial comes as close to anything I have read to an explanation as to why the undecided voters in this country are finding it hard to cozy up to this man and think of him as the one they want leading their country in uncertain times. And this despite the fact that a weak economy has historically meant a change in leadership in this country. We seem to be witnessing something new in American history. Back in January I wrote a blog about Huxley’s classic Brave New World, which has always been one of my favorite books. I taught it for years and have always found mountains of issues worthy of serious thought and discussion. In 1985 Neil Postman wrote another provocative book titled Amusing Ourselves To Death in which he promises to discuss the question whether Huxley might have been right in his predictions about what was to become of Western culture. Bear in mind that Huxley wrote his novel in the 1930s and he was English. I used Brave New World numerous times in ethics classes and in honors seminars. Discussions were generally lively and the students seemed genuinely engaged for the most part. In one of my last years of teaching I assigned it to a required Freshman class involving well over a hundred students. We met once a week and spent a month on the book. We had a biologist. a psychologist, a philosopher, and a professor of English literature talk about the book from the perspective of their own discipline. We discovered later that many of the students could not read the book — could not comprehend it. Many could not comprehend the cheaters (Cliff’s Notes) they bought that were supposed to explain the complex text (!) to those who apparently cannot read simple prose. Many did not even bother to buy the book. But when the course evaluations came in at the end of the Semester, a number of students, more than I care to recall, asked in unison: “What does this have to do with me?” Indeed. The number of words that have poured forth after Romney’s gaffe about the 47% of Americans who don’t pay taxes (the “Obama supporters”) makes me somewhat reluctant to add my two cents worth. This is especially so since I have already addressed this issue. But that has never stopped me before, so I will push ahead! …, many of those receiving benefits are our young — providing them education and health (even if they or their parents don’t pay taxes) are investments in our future. America is the country with the least equality of opportunity of any of the advanced countries for which there is data. A child’s life prospects are more dependent on the income and education of his parents than in these other countries. While the American Dream may have become a myth, it doesn’t have to be that way. Children shouldn’t have to depend on the wealth of their parents to get the education or health care they need to live up to their potential. This is an important point in my mind. I have remarked before about the death of the Horatio Alger myth but wasn’t aware of the studies Stiglitz refers to. We need to think about the fact that this country was conceived as a community of persons brought together by common interests and hopes. We need to take care of one another when we are down and out — not turn our backs on each other. The founders deeply believed in the notion of “public virtue” which takes us outside of ourselves and leads to selfless acts of kindness — all of which strengthen the community as a whole. But by 1816 Thomas Jefferson, for one, was already beginning to worry about the lack of public virtue in the form of narrow self-interest exhibited by the increasing numbers of corporations hell-bent on making as much money as possible. He hoped “that we shall take warning and crush at its birth the aristocracy of our monied corporations which dare already to challenge our government to a trial of strength and bid defiance to the laws of the country.” To which Mitt Romney replies: “Corporations are people too.” In any event, those who run our largest corporations are the immensely rich who do not care in the least about community and would insist they made it to the top of the pyramid on their own. However, if someone makes it big he assuredly owes it to those — in addition to his parents — who made it possible. To turn one’s back on others who fall on hard times and ignore them as lazy and unmotivated is to ignore the fact that as a community each of us depends on others along the way. Romney’s attitudes, reflected in numerous comments he has made (in or out of context) reveal him to be a man with no sense of history and no awareness of the innumerable people who have helped him get where he is today. The remedy for easing such polarization, here and abroad, may seem straightforward: provide balanced information to people of all sides. Surely, we might speculate, such information will correct falsehoods and promote mutual understanding. This, of course, has been a hope of countless dedicated journalists and public officials. Unfortunately, evidence suggests that balanced presentations — in which competing arguments or positions are laid out side by side — may not help. At least when people begin with firmly held convictions, such an approach is likely to increase polarization rather than reduce it. This is disturbing. What it amounts to is “don’t confuse me with the facts, my mind is made up!” And I gather we all succumb to this intransigent position on most issues we hold dear. What we do, apparently, is weigh the evidence that supports our own conviction more heavily than we do conflicting evidence — which we tend to dismiss. So much for John Stuart Mill’s notion that an intelligent person will attempt to see both sides of an issue before making up his or her mind. If we already lean in one direction or the other on an issue (and who does not?) we will simply find the evidence that supports our point of view compelling and the evidence on the other side weak and unconvincing — even if an outside observer might insist that what we regard as the weaker evidence is in fact the stronger. As a person who spent his life dedicated to trying to help young people gain possession of their own minds, to become thinking human beings rather than performing robots, this article is disturbing. But please note that my deeply held conviction that people can learn to be reasonable is being shaken by an argument I am not comfortable with — and yet I see the strength of that argument in spite of the fact that it calls into question everything I have taught for nearly 50 years. Isn’t this in itself an argument against the conclusions of the study examined in the piece for the New YorkTimes? An interesting paradox! In any event, the article goes on to tell us that the only way we can really change a person’s mind is to have someone they respect — say someone they identify closely with or someone whose opinions they have always revered — evidence a radical alteration of opinion. If, for example, I revere George Will and read that he has decided that the Republican party no longer stands for the ideals and values that he holds close to his heart, that he has decided to become a Democrat and vote for Obama — if, I say, I read that this has happened, then I am likely to change my mind as well. I was always told that this was an appeal to authority and that it is a fallacious way to reason. But apparently it works. This would mean, if it is true, that reason is a slave to the passions, as David Hume told us more than a hundred years ago. And he had no psychological tests to revert to. He just found it to be the case. But then there’s that nagging factoid hanging out there: I find the study summarized in the above article convincing even though I also find the conclusions of the research cited in conflict with my most deeply held beliefs. I am not aware of anyone I admire who has changed his mind about this question, yet I find myself increasingly inclined toward a disturbing point of view. That seems to make the conclusions of this study a bit less disturbing. I wrote a blog not long ago on the idea of representative government. It fascinates me, I must confess. Why people decided that it was OK for one person to “represent” dozens, hundreds, even thousands of others is so illogical it beggars belief. Rousseau said that we are free only at the moment we elect our representatives; after that we are enslaved to them. And that we continue to call this a “democracy” simply shows how loosely we use words. After the English Civil Wars very near the end of the seventeenth century the Whigs struggled with the notion of representative government even before Rousseau. They knew the best possible form of government was a pure democracy in which each citizen participates in government and partakes in the making of the laws they are then called upon to obey. That’s as close to real civil liberty as we can get on this earth: obeying the laws we make ourselves. But while this may work in a Greek City-State in 300 BC, perhaps, it will not work in the modern world where states tend to be large and unwieldy. So the English experimented with representative government and held brief Parliamentary sessions for their short-term representatives who were supposed to go back home and get directives from their neighbors as to how to vote next time they were called upon to do so. And, of course, the representatives were not paid so they were not eager to stay in office and grow fat while spiders wove webs in their beards. But that didn’t work very well, either, since the sessions were too short and the constant change in personnel made it hard to get anything done (though I dare say the King thought it worked quite well!). So the length of the Parliamentary sessions got longer and the representatives eventually had to be paid and soon we had the birth of the professional politician. The English Whigs were very nervous about this, of course, since they knew that in electing a representative they were in effect transferring their wills to another. And, as they feared, Parliament gradually became a separate body making independent decisions — another sort of despotism, if you will. In fact, members of Parliament could make laws that went counter to the wishes of the people they were supposed to represent: the very opposite of political liberty. As one of the Whigs at the time said, the idea that the representative could do what they liked was “almost too monstrous to conceive.” But that’s what developed. It wasn’t what was in the plan as originally conceived, but it was a plan the Americans adopted after their own struggles with the concept. But as we can see the phrase “Representative Government” is a misnomer. If 95 percent of life is set up in this country, however, it certainly doesn’t reach 95 percent of the people. The U.S. poverty rate has hovered at or near 15 percent for the past few years. Moreover, the same 15 percent of the population is not constantly poor. In fact, recent research suggests that only 15 percent of Americans will not experience some type of economic insecurity in their lives. . . . Fully 85 percent of Americans by age 60 will have experienced unemployment, sharply lower income, poverty or the use of welfare for at least a year of their adult lives, according to a 2012 longitudinal analysis by Mark R. Rank, the Herbert S. Hadley professor of social welfare at Washington University in St. Louis. In a word this man just doesn’t get it. If he really believes what he is saying and isn’t just telling people with fat wallets what he thinks they want to hear, then he lives in a golden-gated community somewhere removed from the world around him watching his wife’s horses go through their paces; he is simply unaware of what is going on in the real world. Indeed, he is so out of touch with the realities of this country one begins to wonder if he suffers from dementia. He certainly isn’t presidential material — even if he were more astute when it comes to foreign affairs where has shown himself astonishingly inept. It is tiresome to repeat what is clear to anyone whose mind isn’t closed, but the poor in this country are not a static group. As suggested in the quote above it is ever-changing and it includes some of our friends and neighbors. If it doesn’t at present it may very well in the not-too-distant future. Note the comment in the quote above — only 15% of the people in this country will NOT experience “some type of economic insecurity in their lives.” Think about that while reading Mitt’s comments about how 95% of the people in this country can make it as he did. And, of course, he would have us believe he made it on his own. He and his ilk remind me of what the wags used to say about George W. Bush: he was born on third base convinced he had hit a triple! Using our homeless families we help as an example, out of about 200 families we helped during the last year, 84% had employment. The remaining 16% were employable, but the economy limited their hiring opportunities. These 84% are teachers, teacher assistants, nursing assistants, bus-drivers, retail and restaurant workers, etc. Their median family wage is $9.00 an hour. It should be noted, in my area, a living wage for a single person is $9.67 per hour while a living wage for a one adult family with one child is $17.68 per hour. These people are making less than is needed to support housing, utilities and food for their family. What we do is help them climb the ladder to self-sufficiency. What we have found is lack of education is key to their circumstances. So is lack of health care. They are living beneath paycheck to paycheck, meaning the check is not covering the bills. Yet, they work hard and are not irresponsible. The poor are assuredly not the lazy bums wealthy people like Mitt Romney would make them out to be. But aside from that, given Romney’s proclivity for saying the wrong thing at the wrong time the truly astonishing thing to me is that the race for the presidency at this point is neck and neck. Aren’t people paying attention? Barack Obama isn’t perfect, heaven knows. But at least he lives in the same world you and I live in and that’s rather important, it seems to me. I just don’t get it. Nor does Mitt Romney, even though he somehow manages to persevere even with his mouth full of his own feet. Wilonda Cannon, a single mother raising her four children in North Lawndale, a West Side neighborhood beset by gang shootings and poverty, said she was relieved that her two youngest kids would be returning to class after spending the last seven school days with their grandfather. Now I’m not completely out of touch with reality, philosopher though I am, but this strikes me as worthy of comment. These parents are relieved that their kids are back in school because it makes their lives easier. I know, I know. It’s not just about that. But it does seem that for these people, like so many others, school is just a way to keep the kids busy while the parents are off at work, doing what really matters. I hate to say this, but it sounds like teachers are being relegated to the roles of baby-sitters. No? Clearly, this is part of the relief the parents feel — and rightly so. It is a confusing mess to try to figure out what to do with the kids when there is no school and parents have to work each day. But what about the real meaning of an end to the teachers’ strike? What about the fact that the kids are returning to school to improve their minds, to get an education? I realize that in Chicago this argument may be a hard one to make. The teachers make salaries well above the national average while it appears their students aren’t doing very well. This would seem to be the case if we look at the usual signs: drop-outs, which are high; graduation rates, which are low; SAT scores, which are below national averages; number of students attending college, which are also below the national average. But then the challenges the teachers have in crowded schools in a city like Chicago must boggle the mind. It’s a wonder they get anything done — and there are success stories that stand out above the dark numbers that scare critics. In fact, it is a wonder that teachers in America’s schools get anything done across the board: they are underpaid — for the most part — and subject to constant scrutiny and criticism by people who want tangible results and are unable to grasp what education is really all about. And beyond that they are asked to raise the kids because their parents are otherwise preoccupied. And that is my point. The comments by the parents quoted above, while understandable under the circumstances, reveal a lack of awareness of what education is really all about that is shared by the vast majority of people in this country. Education is not about keeping kids off the streets, though it does do that; it is not about helping the kids get jobs later on, though it does that (given the restraints of the economy); nor is it about making sure they get into good colleges, though that is a plus; and it is certainly not about raising the kids the parents have too often ignored. Education is about putting young people into possession of their own minds, making sure today’s kids are tomorrow’s thinkers and leaders – at the very least astute enough to detect the smarmy politician posing as one of society’s great benefactors! Let’s not lose sight of what is important in the tizzy of seeing the teachers off the picket lines and back behind their desks — and the kids once again somewhere else being taken care of while Mom and Dad go to work. What’s important are the minds of today’s kids which seem to be a low priority with most of us.